Why does Nazarbaev need a multi-party parliament? As a result of parliamentary elections conducted in Kazakhstan on the 15th of January, the pro-presidential Nur-Otan party (local version of “United Russia” wins over 80% of votes, while the two satellite parties (“Ak-Jol” and “People’s communists”) hardly reach the 7% threshold. With three political parties in the parliament now the political system however remains unchanged. More or less independent opposition parties and movement appear to have had no chance of making it into the parliament: the national Social-democratic party has been decapitated as the two party’s leaders were disqualified two days before the election day, while the original Communist party had been suspended already three months before the election. Another opponent of the ruling regime, the popular party “Alga” (formerly “Democratic choice of Kazakhstan”) has for the last couple of years been trying to get registered, unsuccessfully. Clearly, the regime has done everything it can prior to voting in order to suppress the opposition. Having cracked down on the true opposition, trampled the human rights and freedom of press, and overlooked the shootings of oilmen in Janaozen, the authorities now speak of “upcoming political reforms” and “need for a multi-party parliament”. These are the weird outcomes after twenty years of Nazarbaev rule in Kazakhstan. Already in April 2011, the president’s advisor and chief spokesperson Ermukhamet Ertysbaev made an unexpected statement following the Nazarbaev’s victory at presidential election” “It would make sense if parliament chooses to dismiss itself”. Basically, the president’s advisor had simply voiced his principal’s decision. In less than six months the parliament followed the order and dismissed itself. Then, the rush was presented by the authorities as an obvious move towards modernization and explained as a sign of aspiration to implement the new amendments to the election law which actually required that at least two political parties should be present in the parliament. Though making some sense, the explanations still looked quite naпve: no one had any illusion that opposition could make it into the parliament anyway. When clarifying later the reason for early parliamentary elections, spokesperson Ertysbaev actually admitted that Nazarbaev needed the early parliamentary elections badly while the pro-presidential party Nur-Otan was still dominating and opposition remained dispersed. In other words, Nazarbaev is really keen to strengthen his system of power and provide guarantees for the ruling elite’s well-being for at least another 5 years. Indeed, the “government’s stated ambition to improve the political climate and to conduct more inclusive and transparent elections in line with its international commitments” is absolutely out of question. 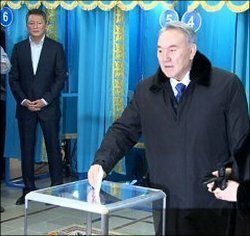 Nazarbaev’s fantastic victory at presidential election in 2007 with 95,5% had never been considered as an obstacle for Kazakhstan’s chairmanship, not to mention the recent killings in Zhanaozen that was basically overlooked by European partners. It is also clear that a new Kazakhstan’s parliament is not going to be a forum for political discussions. Why did Nazarbaev need the early and multi-party parliament anyway? I do believe that Nazarbaev hides a trump card up his sleeve. The “Ak-Jol” party as a runner-up has been quite expected. People say that this party of tycoons and businessmen, commercially and ideologically dependent on the government’s benevolence should be headed by the future Nazarbaev’s successor, one of the president’s close relatives. One way or the other, presence of two fully controllable parties in the parliament gives Nazarbaev a lot of space for future maneuvers: should Nur-Otan gradually gain a reputation of a party of “crooks and thieves’, it will be easy to shift towards the right-wing party and continue to sit on it. This explains in fact why the party is currently led by Azat Peruashev, formerly a loyal member of Nur-Otan. I repeat: none of these efforts lead to a stated improvement of the political climate, but rather to obtaining additional insurances for the implied status-quo, the way it is being perceived by official Astana. The problem is that Astana is completely torn away from the rest of Kazakhstan, while Nazarbaev seems to live on a different planet and see things in his own way, just like any other ageing autocrat. Today’s ruling class in Kazakhstan has completely lost its capacity for an open political struggle in absence of administrative resource as an unfair advantage. All of a sudden, the political system cherished by Nazarbaev throughout the “years of reform and progress” has grown into a main threat for the desirable stability of Nazarbaev’s regime. The only way for him to win an election today is through suppression of opponents using force, courts, and intimidation, relying upon the dependent government and local self-governments, imposing political censorship and resorting to hypocritical support from his “Eurasian” friends and “international community”. Nazarbaev (and Putin) has long missed his chance for a breakthrough in modernization, following the Chinese pattern (on any other pattern, anyway). Holding out promises of fair elections and transparent competition, but sinking into lies, in reality, Nazarbaev unavoidably leads the country towards huge social, economic and political problems in the nearest future. The enormous gap between authorities playing the game of democracy and the ordinary people is ever growing. In case of another Zhanaozen, no satellite parties or the puppet parliament are going to rescue the regime.